In the winter months of 2017, Hotel’s Dominic Jaeckle met artist Jason Shulman in his London studio to discuss his ongoing project, PHOTOGRAPHS OF FILMS, a growing series of durational photographs of canonical pieces of popular cinema. Capturing a film in its entirety—setting the exposure rate to the film’s duration—in each of these images each motion picture becomes an abstract hue of shifting colours and vague shapes. We’re left with a more atmospheric picture of the film’s feeling rather than its content as colours bleed and blur between frames and slowly recompose the film as something altogether more painterly in tone and character. Ahead of our conversation, looking for critical precedence, the introductory remarks to Alexander Kluge’s Cinema Stories felt appropriate. 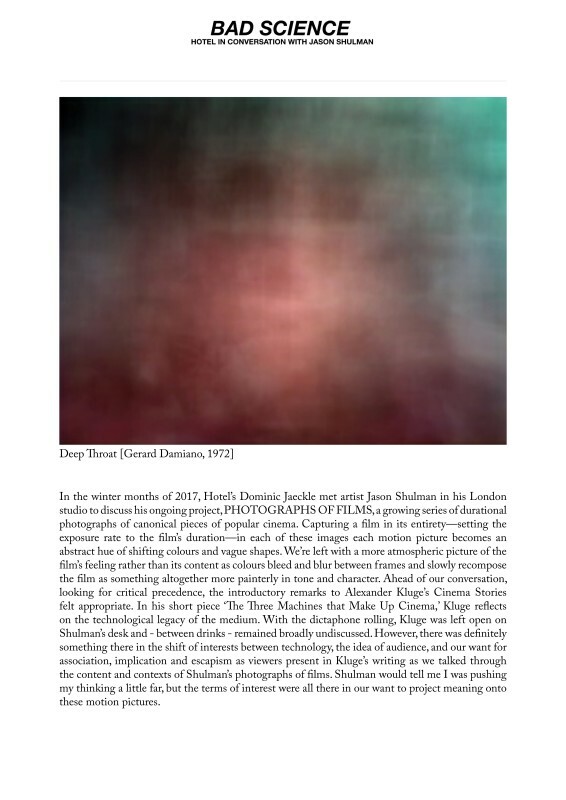 In his short piece ‘The Three Machines that Make Up Cinema,’ Kluge reflects on the technological legacy of the medium. With the dictaphone rolling, Kluge was left open on Shulman’s desk and - between drinks - remained broadly undiscussed. However, there was definitely something there in the shift of interests between technology, the idea of audience, and our want for association, implication and escapism as viewers present in Kluge’s writing as we talked through the content and contexts of Shulman’s photographs of films. Shulman would tell me I was pushing my thinking a little far, but the terms of interest were all there in our want to project meaning onto these motion pictures.